Even in lieu of the worst-case scenario, Hurricane Florence has the potential to join the ranks of the costliest natural disasters in the history of the United States, according to AccuWeather, which says severe flooding could leave some communities under water for days or more. 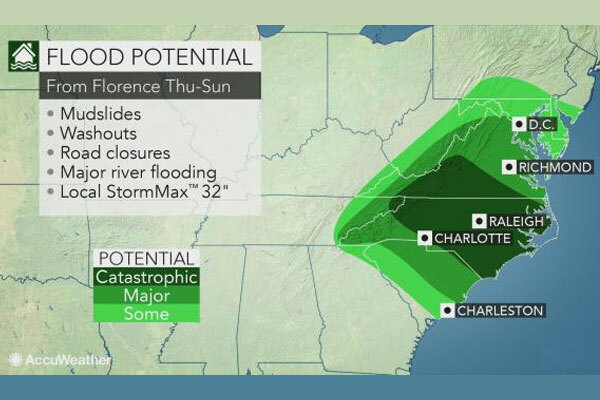 With the potential for Florence’s forward speed to slow and possibly stall, a current forecast of feet of rain would lead to catastrophic flash flooding and major river flooding in parts of the Carolinas, Virginia and possibly other neighbouring states. As AccuWeather meteorologists have warned about since the middle of the summer, any tropical storm or hurricane that moves over saturated ground in the eastern United States during the height of the hurricane season may lead to disastrous flooding. “Strength, track and forward speed of Florence will be the major players in determining the scope and amount of rainfall and correspondingly the severity of inland flooding,” added AccuWeather hurricane expert Dan Kottlowski. In addition to storm surge flooding, inland flooding will escalate from urban and poor drainage areas to small streams. However, even as torrential rain ceases days after the initial first drops from Florence, some major rivers in the region are likely to reach major flood stage.